So finally, months after the BMW 135i Official Press Photos have been released, new official documents showing the BMW 1-series convertible have been released to the press. 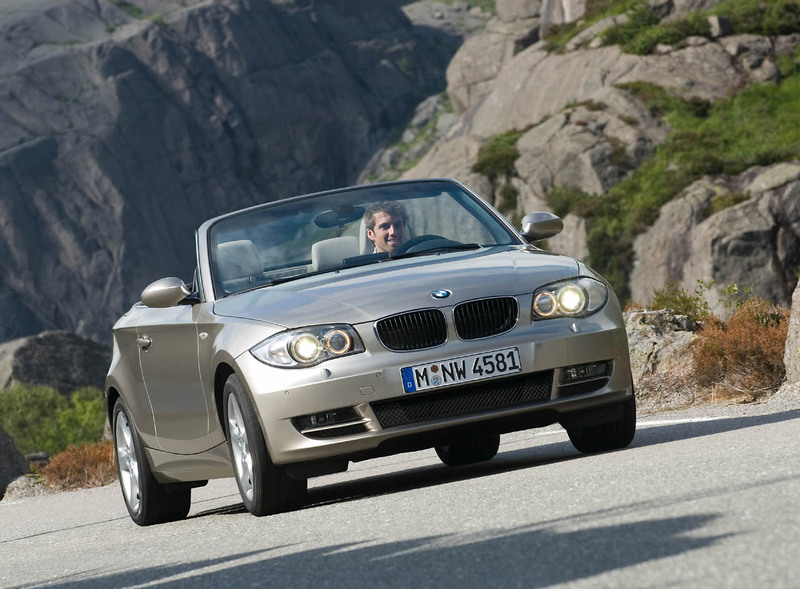 The BMW 1-series convertible line for the U.S market will include two models: BMW 128i and BMW 135i cabriolets. 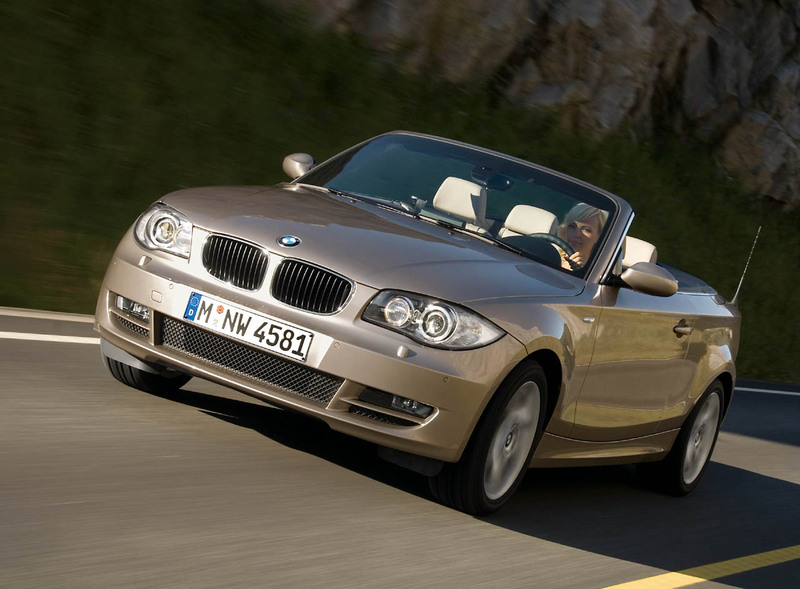 The BMW 128i convertible will be launched in the same as the coupe version, Spring 2008, and the 135i convertible later in 2008. "The standard soft top is available in either black or taupe cloth, but it is the optional Moonlight Black version which is unique to the 1 Series Convertible. Interwoven with fine shiny metallic fibers, this distinctive top produces a shimmery metallic silver appearance in sunlight." The drop top descends in just 22 seconds, which is pretty good, an improvement over previous models. In the mean time, enjoy the beautiful pictures and more will come. Full press release after the photos. 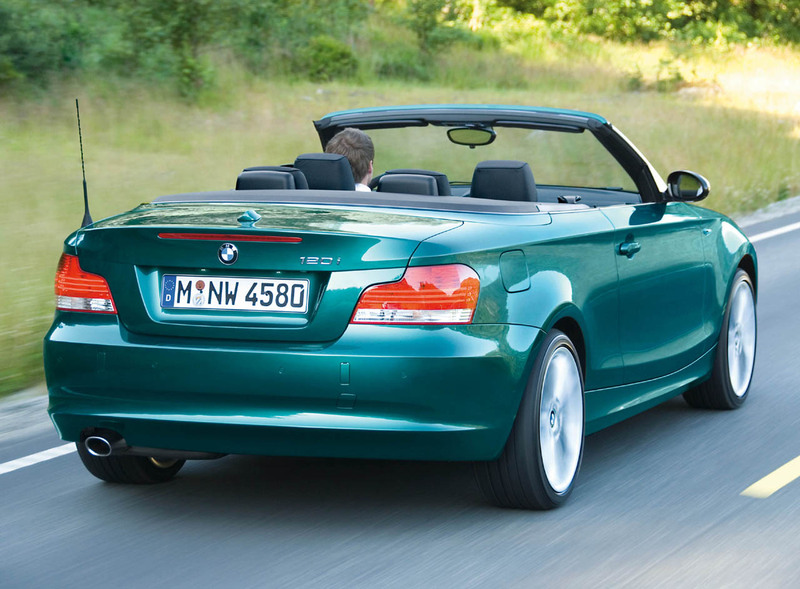 The 128i Convertible, which joins the new 1 Series Coupe going on sale in the spring of 2008, will be powered by BMW’s 3.0-liter, 230 horsepower inline six-cylinder engine generating 200 lb-ft of torque. Like its fixed-roof stablemate, the 128i Convertible will feature Valvetronic valvetrain management and aluminum/magnesium cylinder block construction-core elements of BMW’s EfficientDynamics. 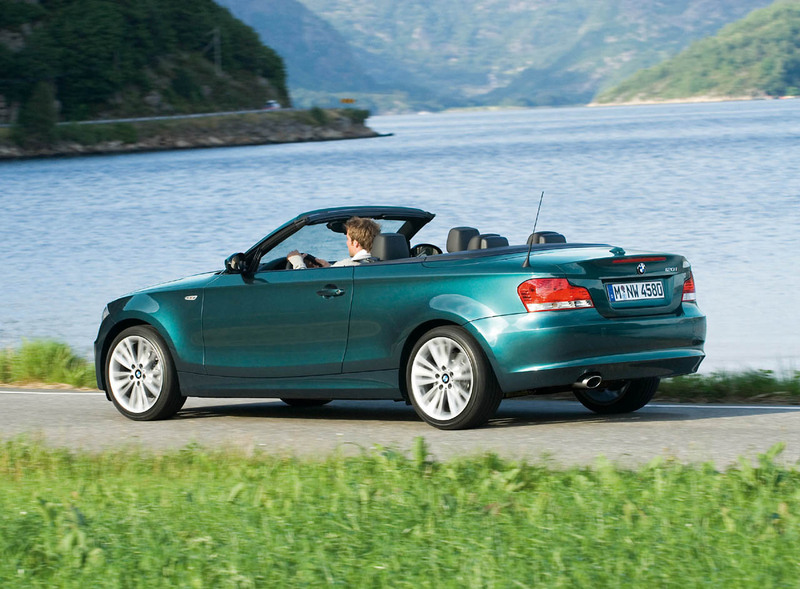 The 135i Convertible, on sale later in 2008, features BMW’s twin-turbocharged 3.0-liter inline six-cylinder engine producing 300 horsepower and 300 lb-ft of torque from as low as 1,400 rpm. With its direct piezo gasoline injectors, twin low-mass turbochargers and air-to-air intercooler, optimum performance and economy is achieved with no loss in engine response. For the 135i Convertible, acceleration from 0-62 mph is accomplished in 5.6 seconds and top speed is electronically limited to 155 mph. Both engines feature on-demand engine coolant pumps that improve fuel economy and reduce parasitic losses for increased efficiency. In a mere 22 seconds-even on the move at speeds up to 25 miles per hour-the occupants within the 1 Series Convertible can go from encapsulated comfort to top-down exhileration. If conditions dictate, the electro-hydraulically-operated softtop can be raised within the same 22 seconds, producing a distinctive silhouette enhanced by long frameless doors. The characteristic features of the BMW kidney-shaped grill, front skirt, door sills and rear skirt are identical to those of the 1 Series Coupe. The standard softtop is available in either black or taupe cloth, but it is the optional Moonlight Black version which is unique to the 1 Series Convertible. Interwoven with fine shiny metallic fibers, this distinctive top produces a shimmery metallic silver appearance in sunlight. The visual effect enhances the convertible’s exciting range of nine colors which includes an exclusive hue: Cashmere Silver Metallic. 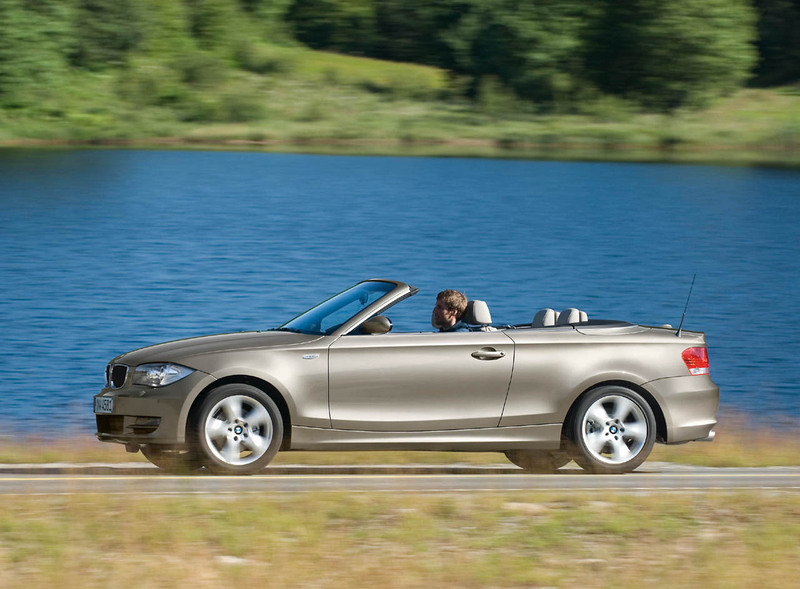 A distinctive feature of the 1 Series Convertible is the flared shoulder line which runs parallel to the road. This shoulder line flows from the hood past the A pillar to the trunk lid, forming a surface which encompasses the entire interior, giving the impression of a boat deck. The view from the rear is influenced by the position of the softtop: with the top lowered, completely concealed in the tail, the look is flat and elegant; the appearance with the top up is broad shouldered. The trunk lid has an integrated spoiler chiseled into the rear end of the car to accentuate the short rear section. On the 135i, an additional lip spoiler provides greater downforce on the rear end at high speeds. The individual sections within the L-shaped rear taillights give the vehicle a lower, sportier look. Horizontal lights integrated in the rear light clusters offer a homogeneous lighting effect with the help of light-emitting diodes (LEDs). 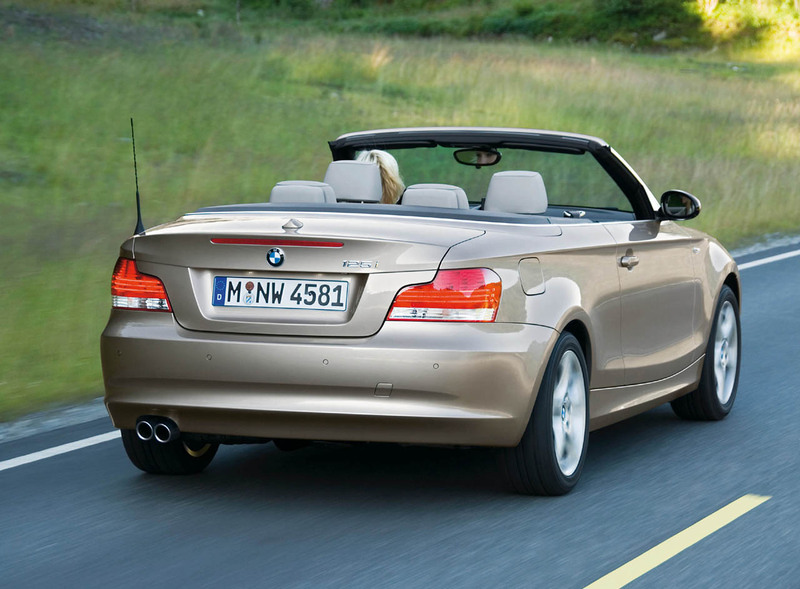 This light design, as found on other BMW models, makes the BMW 1 Series Convertible stand out at night. Also, the Adaptive Brakelights operating in two stages in relation to brake application force are yet another feature typical of BMW, with the additional benefit of extra safety on the road. The standard (on the 135i) Adaptive Xenon Headlights (optional on the 128i), complete with integrated cornering lights, make driving in the dark safer than ever. The daytime headlight function, in typical BMW style, uses the four corona rings around each headlight to enhance the visibility of the car under normal and “murky” light conditions. 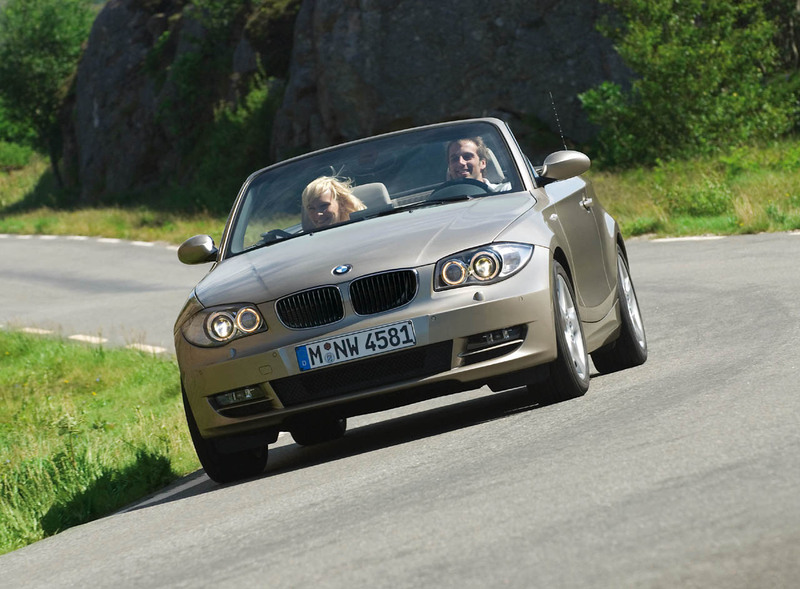 Two unique BMW 1 Series Convertible features provide increased driver and passenger comfort, thus improving the overall experience regardless of the top’s position. The optional Boston leather incorporates BMW’s Sun Reflective Technology where pigments worked into the upholstery mitigate the effect of the sun’s ultraviolet rays. Excessive heating of the seats and armrest is diminished, especially for darker interior colors. The overall effect can produce surface temperatures some 20 degrees Fahrenheit below a comparable “normal” leather interior. The standard upholstery is a sporty and comfortable Leatherette, which is also the covering on the optional Sport Package’s sports bucket seats with enhanced side support (Boston leather can be selected for this package). 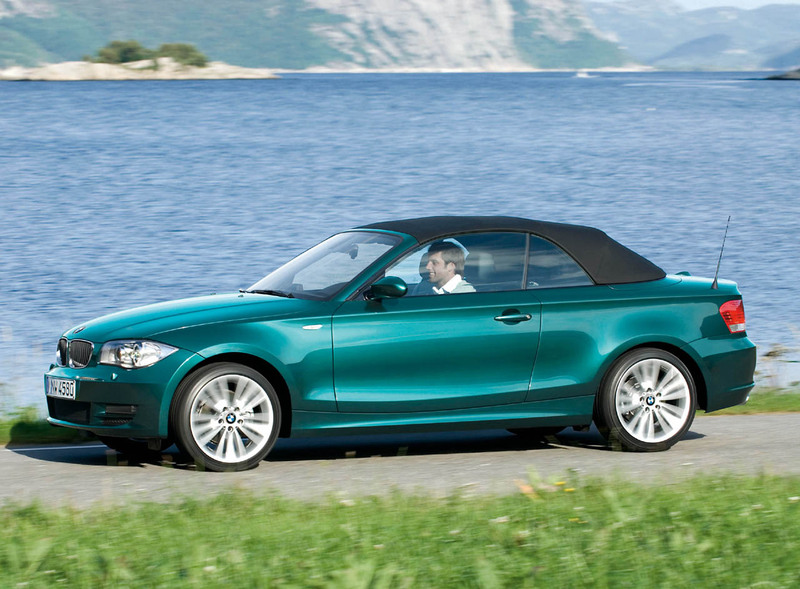 The climate-control system in the 1 Series Convertible has an additional convertible mode (compared to the system in the BMW 1 Series Coupe) designed for open-roof conditions. The three standard modes; gentle, medium and intensive, react primarily to interior sensors, while the convertible mode reacts less to interior temperature and more to the exterior temperature and sunlight factors to establish the intensity of the ventilation. Turbulence in the roof-down cabin can be reduced by an available wind deflector which can be affixed to the sides of the vehicle with a few adjustments. The wind deflector allows for conversation at normal sound levels and the ability to enjoy the wide variety of audio and communication offerings which include SIRIUS satellite radio, HD radio, the optional Premium Sound system and Bluetooth. For simple and straightforward connection of an MP3 player, an auxiliary input jack is standard and a USB port for direct control of an Apple iPod or iPhone media player is available as an option. The control console for the entertainment and climate-control functions is integrated smoothly and harmoniously into the dashboard through its soft radii and flowing surfaces. With the optional navigation system, the iDrive controller is integrated in the center console, following BMW’s characteristic philosophy of full driver control at all times. Galvanized pearl gloss surfaces adorn the interior door handles, the glove compartment handle, the radio’s rotary knobs, the knobs of the automatic air conditioning system, the iDrive controller, and the ornamental trim strips featured on the sport steering wheel. Enhanced iDrive provides programmable memory keys BMW’s iDrive is included with the optional navigation system. It enables the driver to control all secondary and comfort functions such as communication, air conditioning, entertainment and navigation functions easily and conveniently. This latest version of iDrive is equipped with six Programmable Memory Keys allowing the driver to program often-used functions such as navigation destinations, radio stations or specific telephone numbers. Touch-sensitive sensors on each button allow the driver to preview the function on the iDrive screen before the button is fully depressed, activating the command. This allows the driver to choose the stored function safely and conveniently, keeping his or her eyes on the road in the process. An active couple can carry their gear, regardless of the season, thanks to the generous trunk space offered by the 1 Series Convertible. Two golf bags will fit in the trunk of the new 1 Series Convertible – even with the top down! Lowering the soft top produces a storage space that is 8.48 cubic-feet, which does not include the optional large storage bag that extends into the passenger compartment and can accommodate two snow boards or a golf bag without soiling the upholstery. A zippered opening allows access into the storage bag from within the passenger compartment. High-tech suspension with newly-developed differential In traditional BMW style, the new BMW 1 Series Convertible transmits the power of the engine to the rear wheels. This design concept and configuration – engine at the front, drive wheels at the rear – guarantees optimum traction, near-perfect weight distribution front-to-rear, excellent directional stability, and predictable handling. The front suspension is also built to a standard quite unique to its competitive group. The new 1 Series Convertible shares the 1 Series Coupe’s sophisticated suspension system with an aluminum double-pivot front suspension and a five-link fully independent rear suspension in lightweight steel to offer an optimum combination of stiffness and low weight. The very stable track control arms and thrust rods make an important contribution to the car’s driving dynamics and provide exacting wheel control. The standard BMW Dynamic Stability Control (DSC) includes a Dynamic Traction Control (DTC) function that provides electronic intervention to prevent loss of vehicle control, but at a higher threshold before activation. This allows the driver to experience more spirited driving on dry roads and offers more flexibility when driving in more challenging conditions such as in the snow. If the driver desires, both DSC and DTC can be disabled. 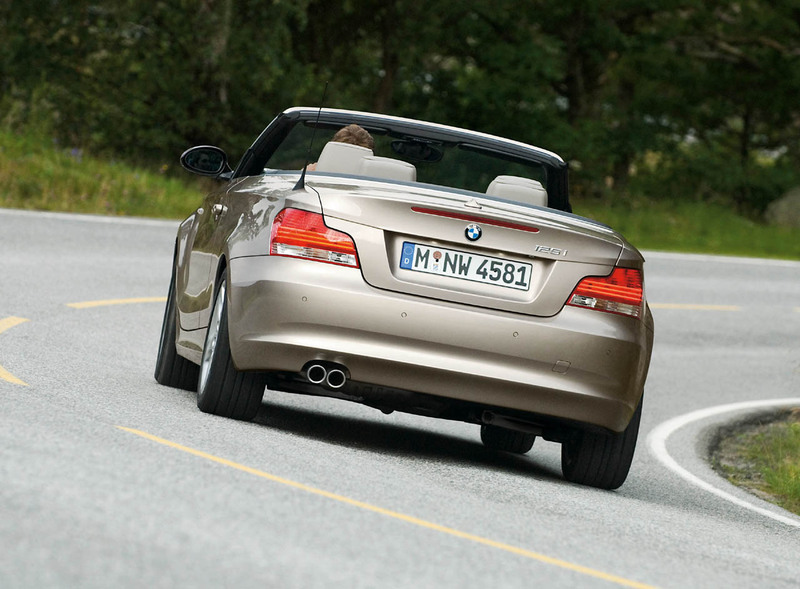 Active Steering, a variable ratio steering system exclusive to BMW, is available as an option. The rear differential on the 1 Series comes from a new generation of final drives optimized for running smoothness. Featuring double-helical ball bearings for the first time, the differential runs at an even lower operating temperature reached more quickly than before thanks to the reduction of fluid required in the differential. 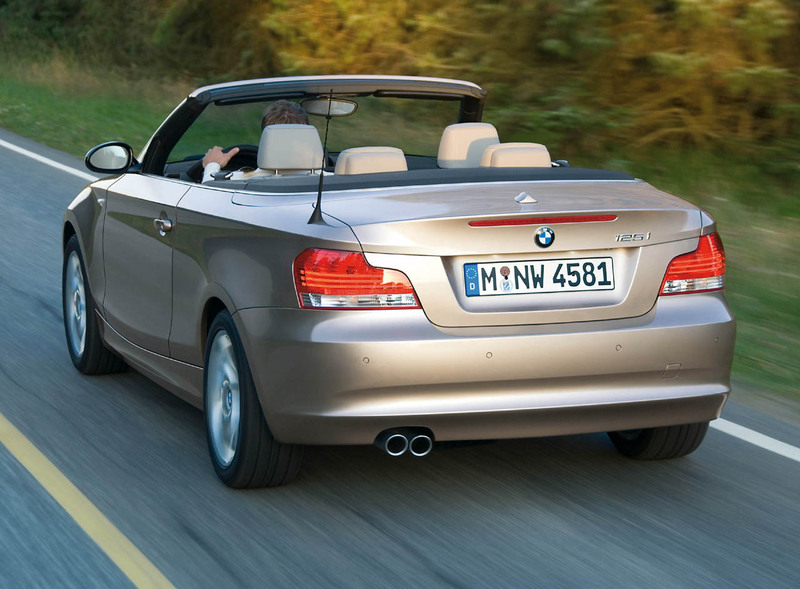 Like the 1 Series Coupe, the Convertible features an electronic limited slip function built into the vehicle’s Dynamic Stability Control system. Safety equipment maximized for convertible design The four standard airbags in the new BMW 1 Series Convertible are designed for the optimum protection of the car’s occupants. The advanced frontal airbags are activated in stages in relation to impact severity while the side airbags integrated into the sides of the front seat backrests reduce the risk of injury at chest, hip and head levels in side impact situations. The new BMW 1 Series Convertible also comes with crash-optimized seats with specially padded headrests and backrests designed to reduce the risk of injury in an impact from the rear. All seats within the 1 Series Convertible are fitted with three-point inertia-reel seat belts and headrests, with the front seat belts str fastened on the frames of the driver’s and front passenger’s seats, keeping the belt in an optimum position around the occupant’s hips regardless of seat height or fore-aft placement. Also, the driver’s pedals move back automatically with a predetermined amount of deformation in the event of a frontal collision so that the risk of driver foot injury is reduced. And last but not least, the rear seats come standard with LATCH attachments for child seats. The new BMW 1 Series Convertible is equipped with a roll-over sensor, which continually monitors the vertical and horizontal movements of the vehicle. As soon as the sensors register the danger of the vehicle rolling over, two roll bars are extended in fractions of a second from their storage areas behind the rear headrests. Simultaneously, the front-seat-belt tensioners and the head airbags are activated. Further roll-over protection is offered by the optimized stability of the A pillar and windshield frame. 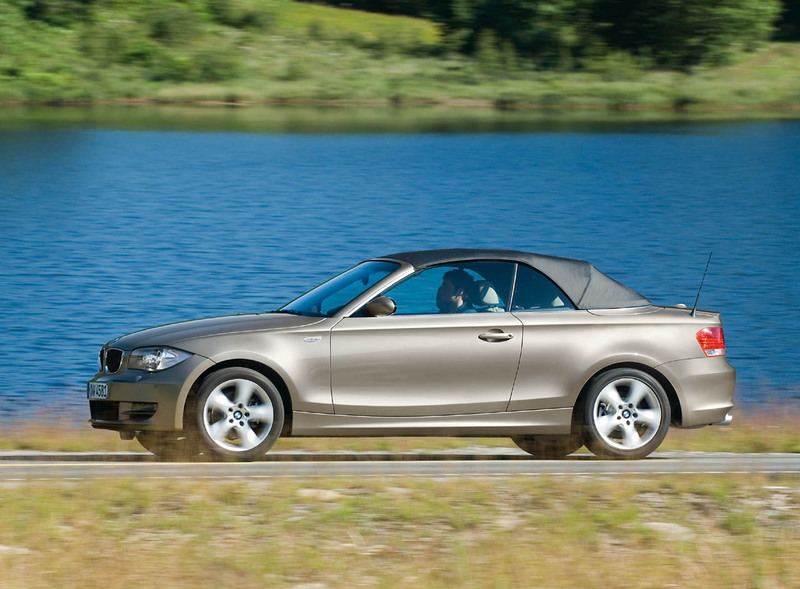 Providing owners with incredible value and peace of mind The BMW 1 Series Convertible will feature BMW Ultimate ServiceTM, a suite of services that includes the BMW Maintenance Program (formerly called Full Maintenance), Roadside Assistance and the New Vehicle Limited Warranty. BMW AssistTM with TeleService is part of the optional Premium Package or can be ordered separately as a stand-along option. The BMW Maintenance Program is the only no-cost maintenance program in the industry that covers wear and tear items like brake pads and rotors for four years or 50,000 miles, whichever comes first. BMW owners pay nothing for all scheduled inspections, oil changes, brake pads, wiper blade inserts and other wear-and-tear items. BMW Roadside Assistance is one of the industry’s most comprehensive plans available. Not only is it no-charge for the first four years, but there is no mileage limit. BMW drivers enjoy the assurance of on-the-road help 24 hours a day, seven days a week, anywhere in the United States, Canada and Puerto Rico. This includes everything from flat tire changes, emergency gasoline and lock-out assistance, to towing, alternative transportation and even trip-interruption benefits. This service also includes valuable trip routing advice. New-vehicle warranty – four-year/50,000-mile coverage of the vehicle. Rust-perforation warranty – 12-year/unlimited-mileage coverage. BMW AssistTM provides the driver with services that enhance on-the-road security and convenience, for added peace of mind. It is a part of the optional Premium package and can also be ordered separately as a stand-alone option. BMW is the only vehicle manufacturer that offers this service for four years at no additional cost. Most other manufacturers cover only the first year of service. The in-vehicle equipment for BMW AssistTM includes GPS technology and hands-free communication functions accessed via buttons in the overhead or center console. Vehicle occupants may request emergency or other services simply by pressing a button; the BMW AssistTM system then transmits the location and vehicle information to the BMW AssistTM response center. A response specialist will then speak with the occupants to coordinate dispatch, notify emergency contacts on file, and link BMW Roadside Assistance or emergency services as needed and requested. A severe accident automatically activates the BMW AssistTM call as well. The BMW AssistTM Safety Plan also includes Remote Door Unlock and Stolen Vehicle Recovery services, which can save the owner time and money. TeleService automatically notifies the BMW center when a vehicle will need service. This feature allows the Service Advisor to proactively set up a customer appointment and have the needed parts ready. BMW AssistTM subscribers can also enroll in the BMW AssistTM Convenience Plan (available at an additional cost of $199 per year) to avail themselves to many BMW AssistTM Concierge services, from travel planning to dining reservations, shopping assistance and event tickets, as well as receive directions, and traffic and weather information. A selected destination and its phone number can be sent directly to the on-board navigation system and Bluetooth®–linked mobile phone, after a push of the new Concierge button. The Convenience Plan also includes Critical Calling, a new service that connects the driver in case their mobile phone is not in the vehicle or its battery is discharged. After pushing the SOS button, a BMW AssistTM response specialist will link the driver to his requested party for up to five minutes and for up to four events per year. As before, the BMW AssistTM system includes Bluetooth® hands-free phone connectivity with hands-free phonebook access and dialing by name or number via the steering wheel controls. Use of this feature requires a customer-provided compatible Bluetooth® mobile phone. BMW strives to produce its motor vehicles and other products with the utmost attention to environmental compatibility and protection. Integrated into the design and development of BMW automobiles are such criteria as resource efficiency and emission control in production; environmentally responsible selection of materials; recyclability during production and within the vehicle; elimination of CFCs and hazardous materials in production; and continuing research into environmentally friendly automotive power sources. Tangible results of these efforts include the recycling of bumper cladding into other vehicle components; water-based paint color coats and powder clear coats; near-future availability of hydrogen-powered models; and various design and engineering elements that help make BMWs easier to dismantle at the end of their service life.